In late 2013, when the neutron star at the heart of one of our galaxy’s oddest supernovae gave off a massive burst of X-rays, the resulting echoes — created when the X-rays bounced off clouds of dust in interstellar space — yielded a surprising new measuring stick for astronomers. Circinus X-1 is a freak of the Milky Way. Located in the plane of the galaxy, it is the glowing husk of a binary star system that exploded a mere 2,500 years ago. The system consists of a nebula and a neutron star, the incredibly dense collapsed core of the exploded star, still in the orbital embrace of its companion star. 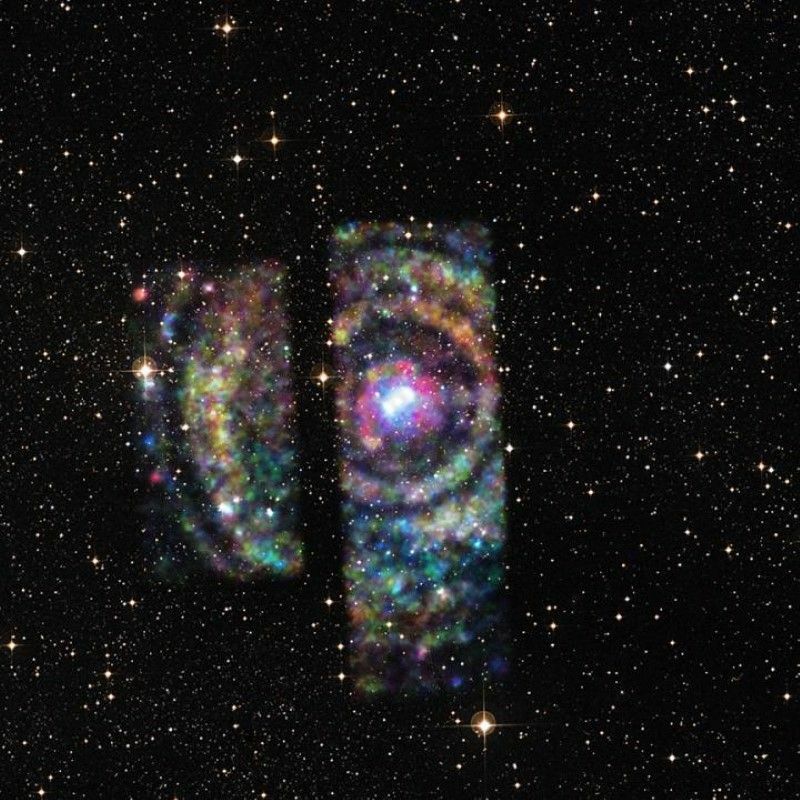 The system is called an X-ray binary because it emits X-rays as material from the companion star spirals onto the much denser neutron star and is heated to very high temperatures.”In late 2013, the neutron star underwent an enormous outburst for about two months, during which it became one of the brightest sources in the X-ray sky,” explains University of Wisconsin-Madison astronomy Professor Sebastian Heinz. “Then it turned dark again.”The flicker of X-rays from the odd binary system was monitored by a detector aboard the International Space Station. Heinz and his colleagues quickly mounted a series of follow-up observations with the space-based Chandra and XMM-Newton telescopes to discover four bright rings of X-rays, like ripples in a cosmic pond, all around the neutron star at the heart of Circinus X-1. The rings are light echoes from Circinus X-1’s X-ray burst. Each of the four rings, says Heinz, indicates a dense cloud of dust between us and the supernova remnant. When X-rays encounter grains of dust in interstellar space they can be deflected, and if the dust clouds are dense they can scatter a noticeable fraction of the X-rays away from their original trajectory, putting them on a triangular path. That phenomenon, Heinz and his colleagues recognized, could give astronomers an opportunity to use the geometry of the rings and a time delay between deflected and undeflected X-rays to calculate the distance to Circinus X-1, a measurement previously unobtainable because the supernova is hidden in the dust that permeates the plane of our galaxy. Combining those measurements with observations of the dust clouds by Australia’s Mopra radio telescope, Heinz and his colleagues were able to determine which dust clouds were responsible for each of the four light echoes. “Using this identification, we can determine the distance to the source accurately for the first time,” according to the UW-Madison astronomer. “Distance measurements in astronomy are difficult, especially to sources like Circinus X-1, which are hidden in the plane of the galaxy behind a thick layer of dust — which makes it basically impossible to observe them with optical telescopes. “In this case, we used the dust that otherwise gets in the way to pioneer a new method of estimating distances to X-ray sources,” Heinz says. Now astronomers know that Circinus X-1, one of the Milky Way’s most bizarre objects, is 30,700 light-years from Earth. The image at the top of the page shows Circinus X-1 residing in the plane of the Milky Way, where it cannot be observed by optical telescopes because of obscuring clouds of interstellar dust.